Nos Autem Gloriari in Opertet Cruce Domino Nostri Jesus Chrsit focused on Our Blessed Lord and Saviour Jesus Christ’s institution of the Holy Priesthood and the Holy Eucharist at the Last Supper for our sanctification and salvation. This brief reflection focuses on the events at the beginning of Our Lord’s Passion last evening, Maundy Thursday, starting with his fearful Agony in the Garden of Gethsemane atop the Mount of Olives. We have entered into the Paschal Triduum of the Passion, Death and Resurrection of the Word Who was made Flesh in Our Lady’s Virginal and Immaculate Womb by the power of the Third Person of the Blessed Trinity, God the Holy Ghost, at the Annunciation. It is time for us now to keep Him company in His Real Presence on the Altar of Repose as we reflect upon how our sins caused Him to suffer His Agony and helped to motivate Judas Iscariot to betray Him to the Sanhedrin as He was tried by the Jews and then spent the night in prison for daring to proclaim Himself to be Who He is: God in the very Flesh. Only a handful of genuine mystics have understood the depths of the sorrows that our sins, both Mortal and Venial caused Our Blessed Lord and Saviour Jesus Christ and His Most Blessed Mother to suffer during the events of His Passion, Death and Burial. When Jesus, unrelieved of all the weight of his sufferings, returned to the grotto, he fell prostrate, with his face on the ground and his arms extended, and prayed to his Eternal Father; but his soul had to sustain a second interior combat, which lasted three-quarters of an hour. Angels came and showed him, in a series of visions, all the sufferings that he was to endure in order to expiate sin; how great was the beauty of man, the image of God, before the fall, and how that beauty was changed and obliterated when sin entered the world. He beheld how all sins originated in that of Adam, the signification and essence of concupiscence, its terrible effects on the powers of the soul, and likewise the signification and essence of all the sufferings entailed by concupiscence. They showed him the satisfaction which he would have to offer to Divine Justice, and how it would consist of a degree of suffering in his soul and body which would comprehend all the sufferings due to the concupiscence of all mankind, since the debt of the whole human race had to be paid by that humanity which alone was sinless—the humanity of the Son of God. The angels showed him all these things under different forms, and I felt what they were saying, although I heard no voice. 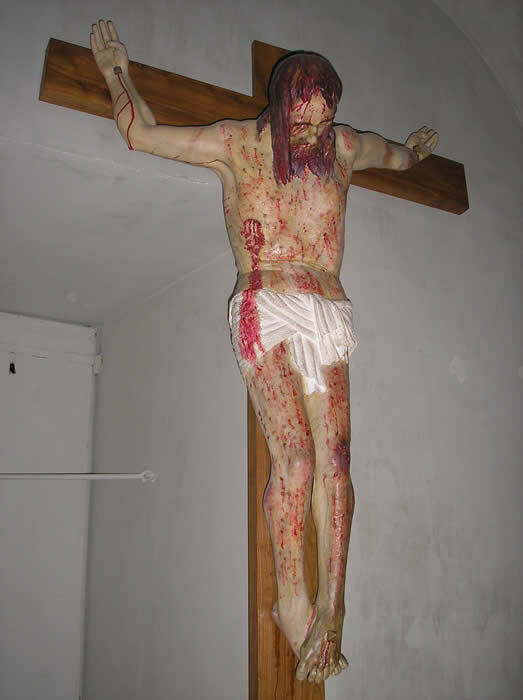 No tongue can describe what anguish and what horror overwhelmed the soul of Jesus at the sight of so terrible an expiation—his sufferings were so great, indeed, that a bloody sweat issued forth from all the pores of his sacred body. The soul of Jesus beheld all the future sufferings of his Apostles, disciples, and friends; after which he saw the primitive Church, numbering but few souls in her fold at first, and then in proportion as her numbers increased, disturbed by heresies and schisms breaking out among her children, who repeated the sin of Adam by pride and disobedience. He saw the tepidity, malice, and corruption of an infinite number of Christians, the lies and deceptions of proud teachers, all the sacrileges of wicked priests, the fatal consequences of each sin, and the abomination of desolation in the kingdom of God, in the sanctuary of those ungrateful human beings whom he was about to redeem with his blood at the cost of unspeakable sufferings.. . . The scandals of all ages, down to the present day and even to the end of the world—every species of error, deception, mad fanaticism, obstinacy, and malice—were displayed before his eyes, and he beheld, as it were floating before him, all the apostates, heresiarchs, and pretended reformers, who deceive men by an appearance of sanctity. The corrupters and the corrupted of all ages outraged and tormented him for not having been crucified after their fashion, or for not having suffered precisely as they settled or imagined he should have done. They vied with each other in tearing the seamless robe of his Church; many ill-treated, insulted, and denied him, and many turned contemptuously away, shaking their heads at him, avoiding his compassionate embrace, and hurrying on to the abyss where they were finally swallowed up. He saw countless numbers of other men who did not dare openly to deny him, but who passed on in disgust at the sight of the wounds of his Church, as the Levite. passed by the poor man who had fallen among robbers. Like unto cowardly and faithless children, who desert their mother in the middle of the night, at the sight of the thieves and robbers to whom their negligence or their malice has opened the door, they fled from his wounded Spouse. He beheld all these men, sometimes separated from the True Vine, and taking their rest amid the wild fruit trees, sometimes like lost sheep, left to the mercy of the wolves, led by base hirelings into bad pasturages, and refusing to enter the fold of the Good Shepherd who gave his life for his sheep. They were wandering homeless in the desert in the midst of the sand blown about by the wind, and were obstinately determined not to see his City placed upon a hill, which could not be hidden, the House of his Spouse, his Church built upon a rock, and with which he had promised to remain to the end of ages. They built upon the sand wretched tenements, which they were continually pulling down and rebuilding, but in which there was neither altar nor sacrifice; they had weathercocks on their roofs, and their doctrines changed with the wind, consequently they were for ever in opposition one with the other. They never could come to a mutual understanding, and were for ever unsettled, often destroying their own dwellings and hurling the fragments against the Corner Stone of the Church, which always remained unshaken. As there was nothing but darkness in the dwellings of these men, many among them, instead of directing their steps towards the Candle placed on the Candlestick in the House of the Spouse of Christ, wandered with closed eyes around the gardens of the Church, sustaining life only by inhaling the sweet odours which were diffused from them far and near, stretching forth their hands towards shadowy idols, and following wandering stars which led them to wells where there was no water. Even when on the very brink of the precipice, they refused to listen to the voice of the Spouse calling them, and, though dying with hunger, derided, insulted, and mocked at those servants and messengers who were sent to invite them to the Nuptial Feast. They obstinately refused to enter the garden, because they feared the thorns of the hedge, although they had neither wheat with which to satisfy their hunger nor wine to quench their thirst, but were simply intoxicated with pride and self-esteem, and being blinded by their own false lights, persisted in asserting that the Church of the Word made flesh was invisible. Jesus beheld them all, he wept over them, and was pleased to suffer for all those who do not see him and who will not carry their crosses after him in his City built upon a hill—his Church founded upon a rock, to which he has given himself in the Holy Eucharist, and against which the gates of Hell will never prevail.. . . It was made known to me that these apparitions were all those persons who in divers ways insult and outrage Jesus, really and truly present in the Holy Sacrament. I recognised among them all those who in any way profane the Blessed Eucharist. I beheld with horror all the outrages thus offered to our Lord, whether by neglect, irreverence, and omission of what was due to him; by open contempt, abuse, and the most awful sacrileges; by the worship of worldly idols; by spiritual darkness and false knowledge; or, finally, by error, incredulity, fanaticism, hatred, and open persecution. Among these men I saw many who were blind, paralysed, deaf, and dumb, and even children;—blind men who would not see the truth; paralytic men who would not advance, according to its directions, on the road leading to eternal life; deaf men who refused to listen to its warnings and threats; dumb men who would never use their voices in its defence; and, finally, children who were led astray by following parents and teachers filled with the love of the world and forgetfulness of God, who were fed on earthly luxuries, drunk with false wisdom, and loathing all that pertained to religion. Among the latter, the sight of whom grieved me especially, because Jesus so loved children, I saw many irreverent, ill-behaved acolytes, who did not honour our Lord in the holy ceremonies in which they took a part. I beheld with terror that many priests, some of whom even fancied themselves full of faith and piety, also outraged Jesus in the Adorable Sacrament. I saw many who believed and taught the doctrine of the Real Presence, but did not sufficiently take it to heart, for they forgot and neglected the palace, throne, and seat of the Living God; that is to say, the church, the altar, the tabernacle, the chalice, the monstrance, the vases and ornaments; in one word, all that is used in his worship, or to adorn his house. This is a perfect description of our own days, a time in which the full fury of the demons, perhaps knowing that their time is short, has been unleashed on anything that reminds men of their sins and of the true religion that alone can provide them with the remedies to quit their sins and to do penance for them. This is a theme that will be explored in the article to be posted on Easter Monday. Even with the help of such vivid descriptions of Our Blessed Lord and Saviour Jesus Christ's Passion and Death as found in the writings of Saint Bridget of Sweden, the Venerable Anne Katherine Emmrich and the Venerable Mary of Ageda, we can come only to some small degree of an intellectual comprehension of the fact that it was indeed the thought of coming into contact with the very antithesis of Our Lord’s Sacred Divinity, our own sins(! ), our sins in His Sacred Humanity that caused Him to sweat droplets of His Most Precious Blood as He beseeched His Co-Equal Father in Heaven to take the Chalice of suffering away from Him. To even begin to enter into even a tiny, miniscule portion of a true understanding of the horrors to which our sins caused Our Lord and His Most Blessed Mother to suffer during the events of His Passion and Death, therefore, we need the assistance of spiritual masters such as the late Father Frederick Faber of the Brompton Oratory of Saint Philip Neri. The Passion may be said to begin on the Thursday in Holy Week in the house of Lazarus at Bethany. Mary, as might have been expected, opened the long avenue of sorrows, great epochs in substance, though brief in time. Jesus had entered Jerusalem on Palm Sunday in the modesty of His well-known triumph. He had spent that day teaching in the temple, as well as the following Monday and Tuesday, returning however to Bethany at nights, as no one in Jerusalem had the courage to offer Him hospitality, as the rulers were incensed with Him because of the recent resurrection of Lazarus, and none of those who had cried Hosanna on Sunday had the courage to put themselves forward individually and so draw the resentful notice of the chief priests upon them. The Wednesday He is supposed to have spent in prayer on the Mount of Olives, and to have seen the elect of all ages of the world pass before Him in procession, while He prayed severally for each. Judas meanwhile was arranging his treachery with the rulers. It is supposed also that our Blessed Saviour spent the Wednesday night out of doors praying in the recesses of the hill. On the Thursday morning He went to Bethany to bid His Mother farewell, and to obtain her consent to His Passion, as He had before done to His Incarnation. Not that it was necessary in the first case as it was in the last, but it was fitting and convenient to the perfection of His filial obedience. Sister Mary of Agreda in her revelations describes the affecting scene, how Jesus knelt to His Mother, and begged her blessing, how she refused to bless her God, and fell upon her knees and worshipped Him as her Creator, how He persisted, how they both remained upon their knees, and how at last she blessed Him, and He blessed her. Who can doubt but that He also enriched with a special blessing His beloved Magdalen, the first and most favoured of all the daughters of Mary? He then went to Jerusalem, whither His Mother followed Him, together with Magdalen, in order that she might receive the Blessed Sacrament. The last Supper, the First Mass, took place that night, our Lord’s first unbloody Sacrifice, to be followed on the morrow by the dreadful one of blood. Quietly, almost coldly, we seem to say these things. Alas! many words are not needed. Besides what words could they be? To Mary’s heart, to Mary’s holiness, to Mary’s dolor, each minute of those hours was longer than sheaves of centuries bound together in some one secular revolution of the system of the world. Each separate mystery, each blow of the scourging, each fragment of action or suffering which we can detach from the mass, was far, far away of more value, import, size, reality, than it at each moment a new universe, with all its immeasurable starriness, had been called out of nothing, and peopled with beings more beautiful than angels. It is as if the course of all nature were quickened, and time accelerated, and all things bidden to take the speed of thought, and flash onward to the end which God appointed. Like the fearfulness of some gigantic machinery to a child, so to our eyes is the is the vision of our Lady’s holiness, cleaving its way, like some colossal orb in terrific velocity, through the darkness, and the blasphemy, and the blood. Can her soul be he same which left Bethany only yesterday afternoon? The saint in his becoming glory, and the white-faced, querulous sick man on his dying bed, are not further apart than the Mother of yesterday and the Mother of today, apart, yet cognizably the same. She has reached the point of the fourth dolor. She is ready now to meet Jesus with the Cross. St. John, at length, returns to the house with the news of the sentence, and other information. Our dearest Mother, broken-hearted, yet beaming as with divine light in her tranquility, prepares to leave the house with Magdalen and the apostle. The latter, by his knowledge of the city, will lead her to the end of a street, where she can meet Jesus on His road to Calvary. But has she strength for such a meeting? Not of her own; but she has as much strength to meet Him as He has to travel by that road. For she has Himself within her, the unconsumed species of the Blessed Sacrament. It is only with Jesus that we can any of us meet Jesus. It was so with her. We take Him in Viaticum, and then go to meet Him as our Judge. She took Him, in a strange sense, in Viaticum, and went to meet Him as condemned, and on His way to death. It was that unconsumed Blessed Sacrament, which had carried her through the superhuman broken-heartedness of the last twelve or fifteen hours. If that marvellous conjecture be true, as we think it is not, that it was at the moment when the species of the Blessed Sacrament were consumed in Himself, that our Lord cried out, My God, My God, why hast Thou forsaken Me? we can estimate the strength that sweet Sacrament was to her now. Everywhere the streets are thronged with multitudes setting in one tide to Calvary. Heralds at the corners of the streets blow their harsh trumpets, and proclaim the sentence to the people. Mary draws her veil around her. John and the Magdalen lean their broken hearts on hers, for they are faint and sick. What a journey for a Mother! She hardly takes note of the streets, but with their shadows they fling into her soul dim memories of the Pasch twenty-one years ago, and the three bitter days that followed it. She has taken her place, silent and still. She does not even tremble. Some tears flow as if spontaneously from her eyes. But her cheeks are red? Yes,–her tears were blood. The procession comes in sight; the tall horse of the centurion shows first, and leads the way. The trumpet sounds with a wailing clangor. The women look from the lattices above. She sees the thieves, the crosses, every thing,–and yet only one thing, Himself. As He draws nigh, the peace of her heart grows deeper. It could not help it; God was approaching, and peace went before Him. Never had maternal love sat on such a throne as that one in Mary’s heart. The anguish was unutterable God, who had knows the number of the sands of the sea, knows it. Now Jesus has come up to her. He halts for a moment. he lifts the one hand that is free, and clears the blood His eyes. It is to see her? Rather, that she may see Him, His look of sadness, His look of love. She approaches to embrace Him. The soldiers thrust her rudely back. Oh, misery! and she is His Mother too! For a moment she reeled with the push, and then again was still, her eyes fixed on His, His eyes fixed on hers; such a link, such an embrace, such as an outpouring of love, such an overflow of sorrow! Has he less strength than she. See! he staggers, is overweighed by the burden of the ponderous Cross, and falls with a dull dead sound upon the street, like the clank of falling wood. She sees it. The God of heaven and earth is down. Men surround Him, like butchers round a fallen beast; they kick Him, beat Him, swear horrible oaths at Him, drag Him up again with cruel ferocity. It is His third fall. See sees it. He is her Babe of Bethlehem. She is helpless. She cannot get near. Omnipotence had held her heart fast. In a peace far beyond man’s understanding, she followed slowly on to Calvary, Magdalen and John beside themselves with grief, but feeling as if grace went out from her blue mantle enabling them also to live with broken hearts. The fourth dolor is accomplished; but alas! we only see the outside of things. Although this dolor seems to be but one step in the Passion, it has nevertheless peculiarities of its own. The fact of its having been selected by the Church as one of the seven sorrows of Mary implies that it has a significancy belonging to itself. To our Blessed Lady it was the actual advent of a long-dreaded evil. It was the fulfillment of a vision which had been before her, sleeping, and waking, for years. It is the first of her dolors which stands clear of the mysteries of the Infancy, and belongs to the second constellation of her griefs, those of the Passion. There is a peculiar suffering of its own in the coming of a misfortune which we have long been expecting. There is such a thing as the unpreparedness of extreme preparation. We have imagined everything beforehand. We have tried to feel the very place where we were sure that the blow would fall, and to harden beforehand. We have placed the circumstances all round about the sorrow just in the order and position which is our liking. We have thought over and over again what we would think, that we would say, what we would do. We have practised the attitude in which we intend to receive the blow. We have left nothing unthought of, nothing unprovided for. We have made up our minds to it. It is before us like a picture, and, though there has been no little suffering in the anticipation, familiarity has almost taken the sting out of our sorrow before it comes. And then it comes. Oh, the cruel waywardness of the evil! It has not observed a single one of our many rubrics. It has come by the wrong road, at the wrong hour, with the wrong weapon, struck us in the wrong place, and borne no similarity, not even a distant family resemblance, to the romance of woe for which we stand prepared ourselves. It has taken us unawares. It has disconcerted us utterly. We feel almost more wronged by this, than by the evil itself. Moreover, the tension of mind and body, to which we have strung ourselves up for endurance, renders us peculiarity susceptible of pain, and disables us from bearing it one-half so heroically as we had resolved. There are many men, who can meet punishment and death bravely, if it comes at the appointed hour; but if it is deferred, the powers of the soul, which had knit themselves up for the occasion, fall away, and disperse, and often become soft with almost an effeminate softness. And yet to us ordinary mortals, as the poet has justly said, “all things are less dreadful than they seem;” whereas in the case of our Blessed Lady’s sorrows the realities far outstripped the most ample expectations. They fulfilled to the uttermost the cruel pains which were foreseen, and brought many with them likewise, as if tokens of their presence, for which no allowance could have been made even in the clearest prevision granted to her. The sorrow, that had been queening it over all other sorrows for three-and-thirty years, had not met her at last, in the streets of Jerusalem, It came to do its work for God, and it did it, as God’s instruments always do, superabundantly. Even with our Blessed Lady there is a great difference between sight and foresight, between reality and imagination. There is a vividness which could never be foreseen. There is the unexpectedness of the way in which the circumstances are grouped. There is a withdrawal of that medium of time and unfulfilment, which before existed between the soul and its sorrow, and which made it less harsh and galling in its pressure. Besides which, there is a life, an announcement, an individuality in the actual contact of the misfortune, which belongs to each misfortune by itself, is inseparable from it, and is unshared by any other sorrow whatsoever. It may be called the personality of the sorrow. Alas! we all know it well enough in our degree. Many a time it has driven us to extremities. It is always the unbearable part of what we have to bear. It needs not to have lived a long life to be able to say from our own experience that there is no sameness in sorrow; likenesses there are, but not identities. We have never had two griefs alike. Each had its own character, and it was with its character that it hurt us most. So it was with our dearest Mother. Her sorrows, when they lay unborn in her mind, were hard to bear; but when they sprang to life, and leaped from her mind, and with Simeon’s sword clove her heart asunder, they were different things, as different as waking is from sleeping or life from death. Saints Peter, James and John had been taken up by Our Blessed Lord and Saviour Jesus Christ to the top of Mount Thabor when He was transfigured in glory before their very eyes, showing forth the glory that He possessed from all eternity with the Father and the Holy Ghost. He showed them this glory in the presence of Moses and Elias so as to take away the scandal of the Holy Cross when the appointed time, this very night upon which He entered into His Passion, had arrived. What was their response? They were sound asleep as He agonized in the Garden of Gethsemane, seeing before His Mind’s Eye each and every single sin of each and every human being from Adam and Eve until the end of time, including each one of ours. Yes, Saints Peter, James and John slept their way through the first Holy Hour. It cannot be that way with us as we entered into the Paschal Triduum lastevening. We must keep Our Blessed Lord and Saviour Jesus Christ company in the Altar of Repose before He is taken away at noon today, Good Friday, March 30, 2018. We must pray Rosary after Rosary in reparation for our sins and those of the whole world. We must make acts of thanksgiving for everything we have been given, especially for the crosses that are sent our way each day. Each cross is a gift from God. Each cross is a sign of His Provident Love for us. Each cross is a sign of His ineffable Mercy for us, the very means by which we can pay back the temporal punishment due for our sins and to help the Poor Souls in Purgatory and to help convert the most hardened of sinners in this passing, mortal vale of tears, offering each cross to His Most Sacred Heart through the Sorrowful and Immaculate Heart of Mary as her consecrated slaves, freely relinquish the merits we earn by the patient endurance of our crosses so that those merits may be disposed of by Our Lady as she sees fit for the honor and glory of the Most Blessed Trinity and for the good of souls. Remember, none of us suffers as our sins deserve. No cross we are asked to bear is the equal of what one of our least Venial Sins caused Our Blessed Lord and Saviour Jesus Christ to suffer in His Sacred Humanity on the wood of the Holy Cross tomorrow, Good Friday, and caused Our Lady’s Sorrowful and Immaculate Heart to be thrust through and through with Seven Swords of Sorrow. We must thank God for our crosses. We must love the Cross of the Divine Redeemer, at which stood His Most Blessed Mother with such great valor and dignity as she brought us to birth spiritually as the adopted sons and daughters of the Living God. The events of the Paschal Triduum of Our Blessed Lord and Saviour Jesus Christ are meant to transform every aspect of the lives of individuals and of nations until His Second Coming in glory on the Last Day to judge the Living and the Dead. We cannot be indifferent to these sacred events at any moment of our lives. We must be willing sacrifice all worldly honors and successes and riches and respect in order to proclaim ourselves to be friends of the Cross of the Divine Redeemer, proving this friendship in thought, word and deed as we seek with true Charity for souls to bring all men to the foot of the Cross as we exalt the Mother who stood thereat with such great love for her Divine Son and compassion for us erring sinners. There are saints in heaven. They are the heights of the Church of Christ. There are newly-converted sinners upon earth. These are the lowest depths in the happy land of redeeming grace. But the light upon those mountain-tops is the glory of the Precious Blood, and the sunshine in those valleys is the kindness of the selfsame Blood. There are sufferers in purgatory, dwelling in a mysterious region of pain and quietude, of patience and of love. They live beneath the earth, yet are upon their road to heaven. Their land is vast and populous. It is a territory won from hell by the Precious Blood, and its pain made uneternal. It is a detention, not an exile–a detention which is a marvellous artifice of mercy, one of the many compassionate devices of the Precious Blood. There are sufferings on earth, sufferings by which hearts are cleansed, sins swiftly expiated, merits rapidly accumulated: sufferings in which grace comes, sufferings which are likenesses of Jesus, sufferings which are secret loves of God. These earthly sufferings also the Precious Blood alleviates, illuminates, sanctifies, crowns, glorifies, and knows how to render delectable that they who have drunk deep of the Precious Blood get a strange new nature, and thirst for more suffering still. Thus both these extremities of suffering, beneath the earth and on it, belong to the empire of the Precious Blood. If we look outside ourselves, we see everywhere the empire of the Precious Blood stretching away in interminable vista. The whole Church is its legitimate inheritance. The priesthood its army of officials. The catholic hierarchy is its venerable administration. The loft tiara, that most sovereign thing on earth, gleams with it like the polar star of nations. The Blessed Sacrament, multiplied a hundred thousand times, is its own adorable self, its Heart-fountain, and its Five Free Wells, worshipful in union with the Godhead, the beautiful amazing Created Life of the Uncreated Word. If we look within ourselves, there is still the self-same empire of the Precious Blood. There is the character of Baptism, its still inexhuasted grace, its title unforfeited or re-conferred, its infused habits, its heroic Spirit-gifts. There are the footprints of so many Absolutions, the abiding fragrance of such reiterated Communions, perhaps the character of Order and its fearful powers, perhaps the mysterious traces of Extreme Unction, certainly the signet of the Holy Ghost in Confirmation, and nameless graces, nameless vestiges where Divine Feet have gone, and where Divine Virtue still resides. There also is that most innermost sanctuary of the soul, which so few reach on this side of the grave, the secret cabinet where the Holy Trinity dwells blessedly, in the very centre of our nature, up from whose secret recesses joys shall one day break and flow, such as we never dreamed of, such as would look to us now far beyond the possibilities of our nature. All this, outside us or within us, is the empire of the Precious Blood. But it is only in heaven that its supremacy is tranquil and complete. We must mount thither in spirit, where we hope one day to mount in all the jubilee of an incredible reality, if we would see in its full grandeur the royalty of the Precious Blood. Countless saints are there, various in the splendors of their holiness. They are all kings now, who once were serfs, but were redeemed by the Precious Blood. They are the children of many generations, the natives of many lands. They were of all degrees on earth, and in their fortunes the diversity was endless. But they were all bought by the same Blood, and all own the lordship of that Blood in heaven. Whey they sing their songs of praise, songs of a human sweetness which the angels greatly love, they sing of the Lamb slain and of the triumphs of his Blood. When their potent intercessions win hourly graces for their clients who are still struggling upon earth, it is their desire to spread the empire of the Precious Blood, which throws such loyal intensity into their powers. Shall they forget their Ransom, whose freedom is their endless joy? Cast your eye over that outspread ocean, whose shores lie so faintly and far off in the almost infinite distance. It gleams like restless silver, quivering with one life and yet such multitudinous life. It flashes in the light with intolerable magnificence. Its unity is numberless. Its life is purest light. Into the bosom of its vastness the glory of God shines down, and the universe is illuminated with its refulgence. It is an ocean of life. Who can count the sum of being that is there? Who but God can fathom its unsearchable caverns? What created eye but is dazzled with the blazing splendor of its capacious surface? It breaks upon its shores in mighty waves; and yet there is no sound. Grand storms of voiceless praise hang over it forever, storms of ecstatic lightning without any roll of thunder, whose very silence thrills the sols of the human saints, and is one of their celestial joys–that deep stillness of unsounding worship. This is the world of angel. There too the Precious blood reigns supreme. The angels have needed no ransom. Amid their almost countless graces there is no redeeming grace. But there is not a grace in all that sea of grace which was not merited for them by the Precious Blood. They too owe all they are, and all they have, to its blissful royalty. They too sing anthems in its praise, though not the same anthems as the Redeemed. Jesus is Head of angels as well as men; and it is as Man that he is Head of angels. Thus the whole of that marvellous world of glorious intelligence, profound gladness, gigantic power, and beautiful holiness, is a province of the empire of the Precious Blood. Who can doubt its sweet constraints over the immaculate heart of Mary? She is queen of heaven and earth. Far and wide her empire stretches. Its boundaries are scarce distinguishable from those of the Precious Blood itself: so closely and so peacefully do the two sovereignties intertwine. Mary holds sway over the Precious Blood It does her bidding, and she commands with a mother’s right Ye she too is a subject of the Precious Blood, and rejoices in her subjection. Out of her very heart that Blood first came; and out of that Blood came also her Immaculate Conception. It was the very office of her Divine Maternity to minister that Blood; and it was that Blood which from all eternity had merited for her the Divine Maternity. It was the Precious Blood which made her suffer; but it was the Precious Blood also which turned her suffering into dignities and crowns. She owes all to the Precious Blood, to whom the Precious Blood owes its very self. Yet the river is greater than the fountain. The Precious Blood is greater than Mary; nay, it is greater by a whole infinity, because the waters of the Godhead have assumed its uncommingled stream unto themselves. Mary sits upon her throne to magnify the Precious Blood. Her power is used for the propagation of its empire. Her prayers dispense its grace Her holiness, which enchants all heaven, is the monument and trophy of that victorious Blood. Shall it rule also over the Divine Perfections? Behold that inexorable justice, which an infinite holiness stands by as assessor! Can endless worlds of mere creatures satisfy those claims, or appease that adorable wrath? Yet the Precious Blood has done it. A mercy that is limitless, and a justice that is insatiable–will not sin set these attributes at strife? Who shall be peace-maker in such unspeakable debate? The Precious Blood! Justice and mercy have met together, and have kissed each other in the Precious Blood. How shall the decrees of the Creator comport with the continued liberty of the fallen creature? The Precious Blood, heavenliest of inventions! has found a way. The unchangeableness of God shall condescend to wait upon the mutabilities of the fickle creature, and yet its own repose be all the more glorified the while; for this too shall be one of the secrets of the Precious Blood. If greater good comes out of evil, it is through the alchemy of the Precious Blood. If all the Divine Perfections combine in some resplendent work of the Most Holy Trinity, whether it be Creation, Redemption, or the Blessed Sacrament, it is the Precious Blood in which the combination has been made, and which the attributes of God delight to magnify, while it with its adoring ministries is magnifying them. If any of the Divine Perfections will come down from heaven, and walk amidst the nations of men, and give light and scatter peace and healing as it goes, it first puts on the vesture of the Precious Blood, in order that it may not slay but make alive. Justice is occupied in crowning saints. Mercy is forever traversing its empire as if in pure delight at its immensity. Holiness is adorning its infinite purity with the little sanctities of feeble and imperfect souls. Immutability is hourly adapting itself to the changeful needs of innumerable hearts. Omnipotence is putting itself at the disposal of created weakness, as if it were some generous beast of burden serving a master whom it could easily destroy. Eternity is busy commuting time into itself. Love changes is eternal name, and only calls itself by the name of the Precious Blood. All these marvels belong to the empire of the Blood of Jesus. The peace of God is all activity to do the work of that dear Blood. The self-sufficiency of God is toiling as if nothing could suffice it, except the salvation of its creatures. All this is the sovereignty of the Precious Blood. Nay, the dread sovereignty of the Everlasting King seems to be forever passing into the created Kingship of the Precious Blood. Inside the Unity of God, within the life of the Threefold Majesty, even there we find the tokens of the Precious Blood; even there it seems to rule. The Son, who has assumed it, owns the gladness of its love. The Holy Ghost, who fashioned it at first, and now works with it his sanctifying work, broods dovelike with complacency upon its deeps. The Eternal Father chose it as the one thing to appease him; for he too owns the mastery of its exceeding beauty. It seems, if with becoming reverence we may say so, to have widened his Fatherhood. It has added fresh treasures to those inexhaustible treasures which he had in his Eternal Son. But these are thoughts for silence rather than for words. May his infinite Majesty pardon the freedoms which the ignorance of our love has been taking with his perfection! It is of his own goodness that we cannot help loving, even while we tremble. The Most Precious Blood of Jesus was shed in the Agony in the Garden of Gethsemane. It was shed in the Scourging at the Pillar. It was shed when Our Blessed Lord and Saviour Jesus Christ was crowned with thorns. Every single drop of It that had not been shed prior to the Crucifixion was shed as Our Redeeming King hang on the gibbet of the Holy Cross for three fearful hours of unspeakable horror and torture. Yes, “Jesus must be more victorious in our souls, more a conqueror, and more a king. Oh that the Precious Blood might so work in our hearts that life should seem to have only one possible gladness, the gladness of having Jesus to reign over us as King!” Our Blessed Lord and Saviour Jesus Christ must reign as King of our hearts. He must also reign as King of nations. Let us stand with Our Lady on the right side of the Cross tomorrow, Good Friday, and every day of our lives! Behold the only standard of true human liberty. The Church Santa Croce in Gerusalemme, Rome, Italy, Sunday, May 22, 2005, Trinity Sunday.